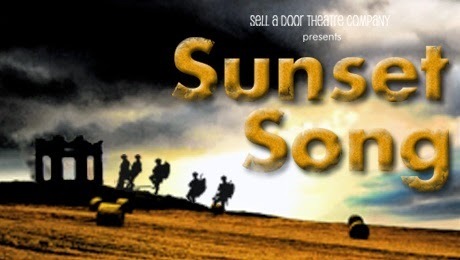 Sell a Door Theatre Company and Beacon Arts Centre have timed their production of Sunset Song, an adaptation by Alastair Cording of the most frequently coined ‘Best Scottish Novel of All Time’, perfectly. In this period of post-referendum limbo where tensions are still high and Scotland’s own identity is being amplified, audiences can clearly see that the same patriotic attributes are apparent of Scotland’s land in Lewis Grassic Gibbon’s dreary 1932 text. This production is not only independence topical as it is also marks WW1 commencing a century ago this past July with the tale set in the years preceding the Great War and the course of its duration. The sharp northeast accent which rings from the lips of the characters living in the fictional village of Kinraddie in The Mearns is one that is so accurate that even Scottish folk will find it a challenge to translate. Rebecca Elise is a wonderful talent portraying our main character, Chris Guthrie, who we follow during the miserable elements of her life until she finds her foot as a woman during the war. A desire for education is throttled by an awful event which leaves Chris in charge of caring for her aggressive father John Guthrie (Alan McHugh), however, it is not long before Chris chooses the magnificent land for herself and the farming rituals it embodies. The novel, which is coaxed in metaphors of harvests, wombs and transmissions, does have the opportunity to reflect well on the stage. There are some powerful moments where this symbolism are showcased, like when the movement of the male characters crofting is replaced by them trudging through the trenches. However, there is very little done to encapsulate visual methods of storytelling. Frequently Chris reflects on the beauty of the land as it changes from season to season. Lighting Designer Alexander Ridgers captures this mood through colour, yet a screen at the back of the set is never exploited to illuminate any beautiful images of what Chris is witnessing. The realism of the drama is complimented through the lack of music performed in the play as when there is a joyful rendition of Auld Lang Syne it feels incredibly out of place. One song that is repeated in a cappella throughout the play by Rob Duncan (Sandy Nelson) is Spanish Ladies which allows us to quickly understand this characters charismatic trait. Any instruments or props that are used to create sound effects like the harsh wind are performed by the actors on stage, which again adds to this rustic atmosphere. There is no question that Gibbon’s has formed an extremely powerful tale that has a very special place in Scotland’s heart and history. 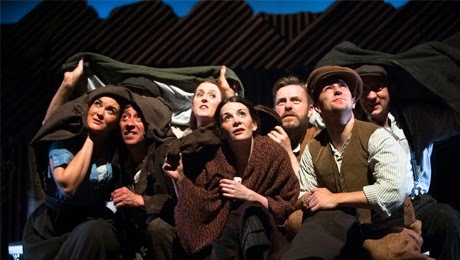 We can very much understand director Julie Ellen’s decision to deliver Cording’s very authentic interpretation of the novel, however, it would be compelling to see a rendition of Sunset Song where the advantages of using the medium of theatre, like movement and visuals, can be manipulated to represent Gibbon’s metaphorical elements. Sunset Song is at the King’s Theatre until 25th October.